Most of us get nose bleeds now and again. They’re usually pretty mild and quite easy to stop. That’s not the case for everyone though. Most people don’t know the proper way to stop a nose bleed. As a parent it’s especially important to know how to properly handle nose bleeds in kids. As a teaching major there are many things that I have learned over the years. Not surprisingly there were things about first aid that I needed to know. One of the things I learned was how to properly stop nose bleeds. 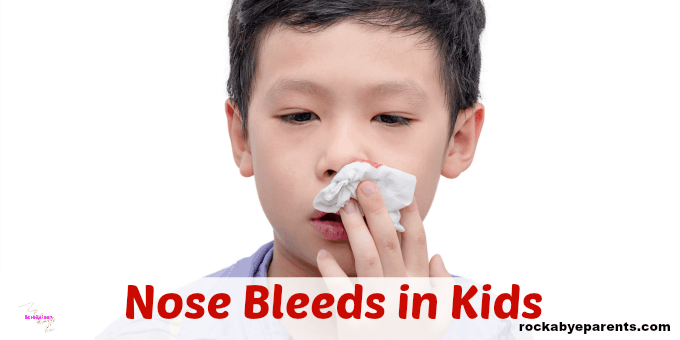 Nose bleeds in kids are quite common. Spend time working with a group of kids and it’s something that will come up. Sometimes it’s from small accidents on the playground. Other times they come out of nowhere. Even though teachers are trained in how to stop nose bleeds the typical response is to hand the student a tissue and to send them to the office. That’s usually all that is needed. As a parent though it’s a bit different. You are the one in charge and you need to get the bleeding under control. It has been many years since Nick has had a terrible nose bleed, but it used to be more common. Nick never got small nose bleeds either. When he got them there was always so much blood it looked like a scene out of a horror movie. I’ll never forget the first bad one he had. We were on vacation at my grandparent’s cottage in Florida. In an instant blood starting dripping out of Nick’s nose and then it started coming out heavily. Even with my training I found my own head went fuzzy while I watched all that blood coming out of my son. I got myself together though and was able to help him. Luckily I knew what to do. When it comes to nose bleeds the first thing everyone wants t know is how to stop them. There are a few steps to take. Especially if it’s a really bad nose bleed. Before I get into the steps though I want to stress something. Many of us were told in our childhoods that if we have a nose bleed we should lay on our backs to help stop the blood from flowing out, but this is not what should be done at all! Now, with that public service announcement out of the way here is what you should do to stop a nose bleed. The first thing you need to remember is to stay calm. Your child likely will already be upset about the situation, and they probably aren’t going to be happy about what they have to go through to get the bleeding to stop. If you don’t present a calm appearance to your child then there is no way that they will be. Act in control (even if you don’t feel that way) to calm your child’s nerves. Move swiftly, but surely, and talk to your child in a calm and soothing voice. You might have to put a little authority into your voice to get through to your child. Just try to do it in a calm way. To stop the blood flow have your child lean slightly forward and then pinch the soft part of their nose shut with your thumb and fore finger. Your child will need to breath through their mouth during this part. Younger children can get scared at this point because they worry about not being able to breath. Instruct them to breath through their mouth and talk them through what is happening. If possible keep the nose pinched shut for 10 minutes. If you child can’t last that long then just do it for as long as you can. Nick can never handle 10 minutes straight, so we often have to take a moment to stop and then try again. If you have to stop make sure to hold a tissue near their nose to catch any dripping blood. If your child’s nose is still bleeding after the first 10 minutes than reapply pressure and check again in another 10 minutes. 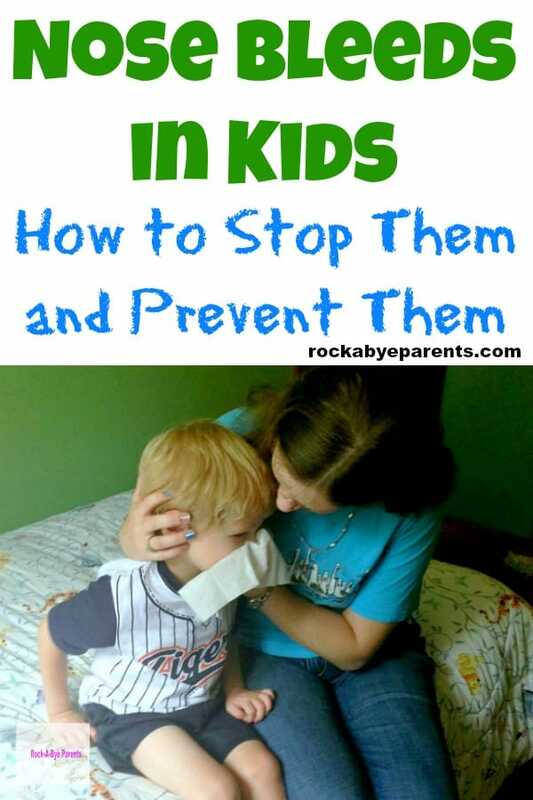 While you’re pinching the nose shut you can hold an ice pack to the nose and cheeks (if your child will stand for it). The cold will constrict the blood vessels and help stop the bleeding. Once the nose bleed has stopped there are some things you can do to keep the blood from coming back. The main thing is to make sure that you child doesn’t blow their nose for awhile. WebMD says that after a nose bleed you shouldn’t blow your nose for 12 hours. That certainly is easier said than done though. Just get your child to go for as long as they can without blowing. You can also put some Vaseline on the inside of their nose. This helps to remoisten the membranes in the nose. Not all kids like this though, so don’t be surprised if they get upset over the thought. So now you know how to stop a nose bleed, but it’s even better to prevent one from happening in the first place. Nose bleeds are mostly caused by the membranes in the nose drying up. This often happens due to dry air conditions, or from over use as can happen at the end of a cold. As I mentioned above you can add moisture back into the nose with Vaseline. All you need to do is get a little Vaseline on your finger tip and rub it inside the nose right at the opening. Then you just leave it there. It’ll eventually just dissolve or will come out when your little one wipes their nose. I always do this if I notice the start of a nose bleed, but you can do it if you think conditions are right for causing a bloody nose. The easiest way to keep the membranes in the nose from drying out is by keeping the air moist. Nick and I both have humidifiers in our rooms. They’re great not only for helping with nose bleeds, but they help keep our skin from drying out to help prevent eczema as well. The one we have for Nick’s room is a Crane USA Filter-Free Cool Mist Humidifier for Kids. These humidifiers are made to look like animals and are simply adorable! Nick’s is a dog, but that look isn’t one that is actively sold any more. You can often find them for around $30 which is a great price. If you see one under $25 grab it. That’s a really great deal. While I personally wouldn’t do this as a first step, if your child is having heavy nose bleeds consistently than you probably should talk about it with their pediatrician. In some cases they can cauterize the nose to keep the bloody noses from even occurring. They actually had to do this for one of my younger cousins and it completely stopped her nose bleeds. In other cases consistent bloody noses can be a sign of something more serious. It your child is getting heavy nose bleeds often it certainly is worth a trip to the doctor to make sure everything is alright. Nose bleeds in kids are anything but fun. They can be upsetting for both parent and child, but they usually are something that some at home first aid treatment can help. Thanks for sharing these tips. My granddaughter gets nose bleeds too. I don’t think I could implement pinching her nose, but we do implement the ice pack. Her nose bleeds seem to occur when her room gets too hot. So, the humidifier is a great addition to a bedroom. Thanks for sharing. The pinching can be tough. When Nick gets a bad nose bleed though it has been our only option in stopping it. Luckily Nick hasn’t gotten a really bad nose bleed like that in quite some time. *knock on wood* Nick’s usually dry from dry air too and a humidifier really helps prevent them. Thank you for sharing these tips. This is good to know. I hate it when my boys get bloody noses! Great tiop sand I know I’ll use them…unfortunately ,lol!